If you are using RUN_REPORT in any of your OpenInsight applications, then you just have to head over to sprezz.com’s blog and check out their latest posting. Linked here, the posting highlights a performance issue that results in a report crashing out after running for sometime. Needless to say, following several days of sleuthing, the guys at Sprezzatura found the root cause and handed the research to Revelation. Also needless to say, Revelation has already fixed the issue and OpenInsight developers will be able to test their reports in the new OI beta 3 release. OpenInsight 9.2.1 saw the introduction of a Debugger Intercept facility and this can be used to create a Debugger Dump file. The debugger_dump procedure is designed to be executed from within a “debugger intercept” procedure which is triggered when the engine hits a debug condition. 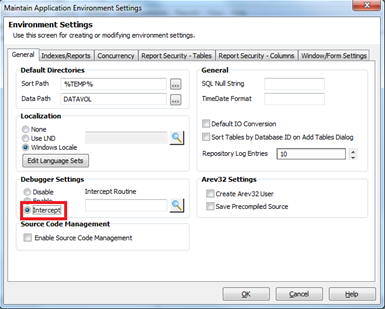 The intercept can be setup by simply openning the Database Manager and chosing the Environment Settings option from the ‘Database’ menu. On that screen the Intercept radio button can be selected (as shown in the graphiv opposite). The debugger intercept procedure by default is called “Debugger_Replacement” and an example version is supplied with OpenInsight and you can change this to your own procedure if you wish by updating field 54 of your application’s environment record (see the ENVIRON_CONSTANTS insert) or use the dialog above. Once in the intercept routine you can look at the contents of any variable in the broken program with the debugger_Fetch() function. An example of how this works can be found the the debugger_dump() procedure, also supplied with OpenInsight. This simply attempts to write out the local and global variables to a text file. One thing to remember about working in the debugger intercept routine is that the engine is already in an error state – your code should do the minimum possible to handle the error and then return – doing lots of screen updating, displaying messages and stuff probably isn’t a good idea. When we use this we normally write the errors out to a log or send an email and then return. Thanks to Carl Pates (Sprezzatura) for this article. This is a Revelation-based application out in the ‘real’ world, being used in board rooms and meeting centers all over the world. Do you have a Revelation or OpenInsight app out there? Let us know! As many of us now maintain our professional profiles on LinkedIn, I have created a LinkedIn Event for the forthcoming RUG. I will apprecite it if you could still register for the RUG and/or O4W training session with me by email, but this event publication on LinkedIn will enable anyone who plans to come along to register that they are attending or that they are interested in attending. This will also enable attendees to schedule one on one discussions with friends and fellow developers/users ahead of time. The event can be found at http://events.linkedin.com/Revelation-User-Group/pub/829527. Revelation Software has released the office Revelation Software Conference 2011 write up and a short slide show of some of the images from the show. Click here for more.